Jungle City Studios Penthouse Studio East features a retro futuristic design which includes a cutting edge 48-input SSL Duality Console and a vintage EMI TGI12345 Mark III Console. One of only 20 built for EMI Studios in Europe, the rare EMI Mark III has been totally refurbished and recapped. With the perfect blend of analog and digital gear, Jungle City’s Penthouse Studio East can accommodate any project. Whether it’s recording or mixing an album project, 5.1 surround mixing, video shoots, hosting a listening session or just having an event, the 2400 sq foot space is completely private and is well fitted with all the latest technologies. 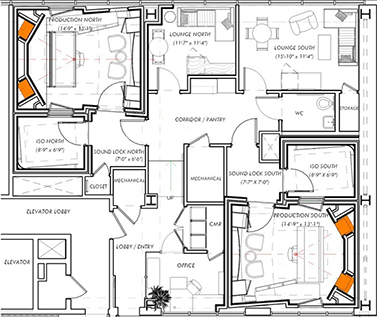 Our private Penthouse Studio East features 14-foot ceilings, an apartment-style lounge (with kitchen, bathroom, HD 3D Sony TV), full sized terrace, and rooftop access. 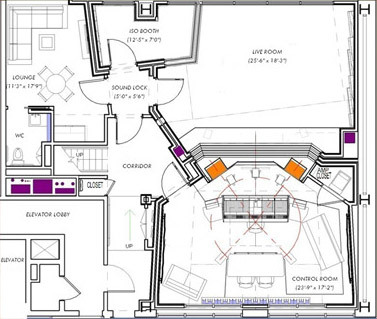 The 500 sq foot live room includes a treated ISO booth and large glass windows with views of the NYC skyline. Unique, custom acoustical treatments like our custom rear wall glass diffusor in the control room allows for natural light and breathtaking views of the Hudson River.